You Think The Bills Have Questions? Last week I reviewed the questions the Bills have to answer before they can become a playoff team. This week I would like to take a look at the other teams going for the sixth playoff spot and the questions they need to answer. First let’s go with the premise that these five teams are in: New England, Pittsburgh, Houston, Jacksonville and San Diego. At least on paper these teams look to be very good this year. 1. Can they get a pass rush and make this defense very good? 2. Who’s going to be QB and can he be as good as Tyrod? 3. Can the Bills find replacements on the offensive line for Incognito and Wood? 4. Who will step up as a receiving target for the new QB? Now let’s look at the other five teams going for the sixth playoff spot and review their questions? Is this Joe Flacco’s last year? The Ravens drafted Lamar Jackson with the last pick in the first round. I think Flacco is done and the Ravens will turn to Jackson before year’s end. The offensive line is a huge question for the Ravens. This doesn’t help Flacco who’s a statue back there. The Ravens lost Ryan Jensen and Luke Bowanko in free agency. I’m not high on Orlando Brown, who they drafted from Oklahoma. Remember he had the worst combine ever by an offensive tackle. How much will Michael Crabtree and John Brown help the Ravens receivers that have been awful in recent years? Will the Browns be two easy wins for the Ravens like previous years? On paper the Browns have the second best team in the division. The schedule isn’t kind as well, in terms they need to play the tough AFC South. How many division wins does this team get? I believe Jacksonville and Houston will be very good. The Colts won’t be horrible if Andrew Luck plays. It’s hard for me to see this team going even 3-3 in the division. This is a make or break year for Marcus Mariota. Mariota had his worst year as a pro last year, throwing more interceptions than touchdown passes. Mariota now has to deal with his third new head coach in only his fourth year as a pro. His receivers have big questions. Corey Davis needs to be far more productive than he was last year as a rookie. The defense has questions as well. The biggest maybe be rushing the passer. Harold Landry, their first round pick, may need to make an immediate impact. The Titans rushing game slipped from top five to 23rd last year. Can they run the football like they did two years ago? Will the second coming of Jon Gruden be as good as the first? Whenever a coach comes back for a money grab I question how successful the second time around will be. 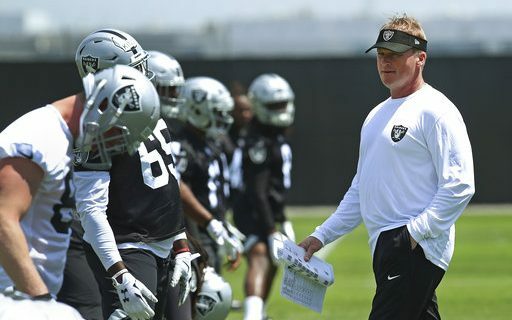 Gruden has been out for 10 years, He joked about how his team won’t use analytics. I don’t think the Raiders addressed the defense enough. As good as Khalil Mack is the Raiders haven’t ranked higher than 23rd in sacks since 2015. With their first pick the Raiders took Kolton Miller a tackle from UCLA. I think he struggles in his first year in the NFL. The secondary was a mess last year. Gareon Conley gave the team little production. I can’t see the Raiders making the playoffs with this defense. How good is Case Keenum? Keenum had a great year last year for Minnesota but doesn’t it speak volumes that Mike Zimmer let him walk. Keenum might need to shoulder the brunt of the offense because Denver couldn’t run the football last year. Rookie Royce Freeman maybe the best chance the Broncos has at a running game. The problem is the Broncos didn’t address the offensive line needs. The offensive line is pretty much the same group last year that wasn’t good enough at protecting the quarterback or running the football. The Broncos lost one of their lock down corners in Aqib Talib to free agency. Can Bradley Roby be as good as Talib? The biggest questions the Chiefs have are on defense. The advanced statistics DVOA for example, had the Chiefs defense as the worst in football. Anyone that watched the Chiefs realized this defense didn’t pass the eye test. Somehow Bob Sutton kept his job as defensive coordinator. The Chiefs did little in free agency to help the defense. They didn’t have a first round pick because they traded it to the Bills. The Chiefs used every other pick in the draft to try to address the defense. Will these rookies help one of the worst defenses in football? On offense the team is loaded at the skill positions. They got Sammy Watkins in free agency. They health of often injured guys like Sammy Watkins, Dee Ford and Eric Berry will be a key? We haven’t even asked the question of will Patrick Mahomes in his first year be better than Alex Smith? The point of this article is before you say the Bills won’t make the playoffs next year maybe you should look at the problems other teams have before making such a bold statement.